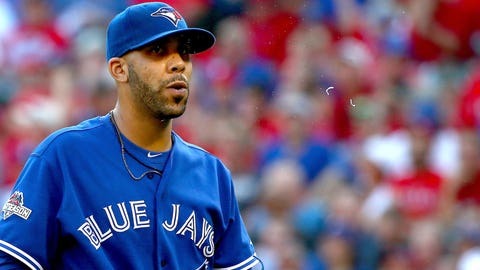 David Price is aware of his odd usage in the ALDS. When David Price appeared in Game 4 of the ALDS for the Toronto Blue Jays, many people questioned manager John Gibbons move for more then one reason. The Jays were up 7-1 over the Texas Rangers, with Price slated to pitch the decisive Game 5 in Toronto. Price tossed 50 pitches, gave up three runs and was burned for the final ALDS game. Marcus Stroman went on start Game 5, propelling the team to the ALCS against the Kansas City Royals. Since he is starting Game 6 on Friday, Price appeared before the media Thursday and was again asked about his appearance in Texas. To his credit, Price has volunteered himself to pitch out of the pen multiple times this postseason, most recently for Game 5 of the ALCS. Price will look to earn his first win as a postseason starter on Friday, ALCS Game 6.